Happy Pi Day! 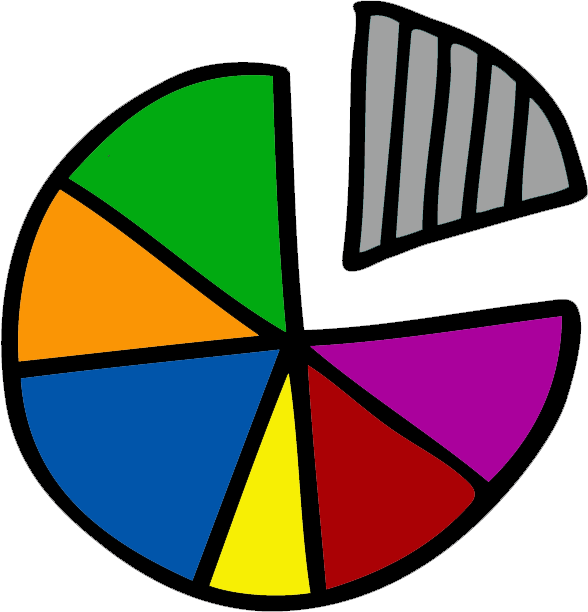 Enjoy these 3(.14) ways to use pie charts! Happy Pi Day! What’s that exactly? Remember geometry and learning about finding the area and perimeter (aka circumference) of circles? To get your calculation correct, you need Pi in your equation. You might also see pi as the Greek letter “π”. It’s the ratio of the circumference of a circle to its diameter — which is always approximately 3.14159… (it’s actually been calculated to over one trillion digits beyond the decimal point!). In the US and some other countries we write our dates in a MM/DD/YY format so today, March 14th, is 3/14 — Pi Day! And even though most other countries write their dates in a DD/MM format, today is generally accepted as Pi Day worldwide since there are only 12 months. If you’re nerdy like me, you can read more about Pi Day here. Yes, it’s a real thing. Yes, it has its own website. 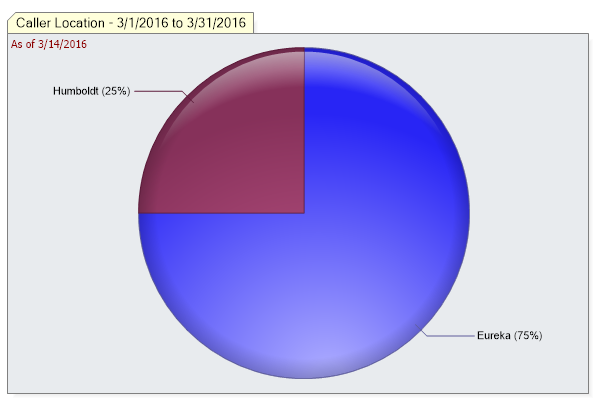 In honor of Pi Day, here are 3 interesting uses of pie charts in iCarol. 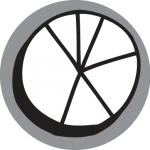 Use Pie Charts to give you a sort of broad overview of how the numbers or percentages are shaping up for a certain sub-category of your contact form. Or, use it as an overview of your location breakdowns. In the Analysis tab of Statistics, when selecting Chart Type, you have two Pie Charts to choose from, either Caller Issues and Demographics (which will start by showing you all the Categories on your contact form) or Caller Location. The resulting charts are below. 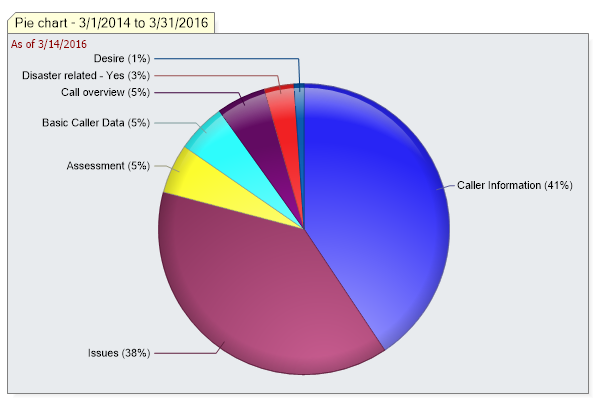 If you selected the Caller Issues and Demographics chart you get this broad overview of your contact form Categories. And if you selected the Location pie chart you’ll see a high level look at the geographic location entries. Once you’ve got that high level pie chart available, you can click on pieces of the pie to drill into the data below. Drilling into a Category will then show you the sub-categories that are available. These sub-categories are the Groups or questions asked within each category on your contact form. On a location chart, drilling into the State or Province piece of the pie will show you the county level information. If we take our Caller Issues and Demographics chart above and drill into the mauve colored “Issues” category, we’ll see the Issue choices of sub-categories. 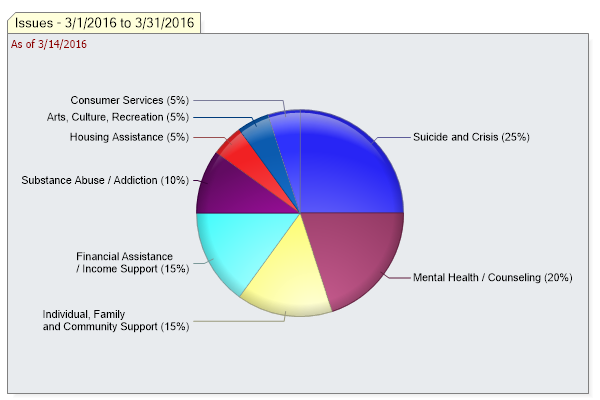 If we click on the “Mental Health/Counseling” piece of the pie, we’ll drill down to the lowest available level, which are the field choices or answer options within that sub-category. These are the items you may find in the drop-down or list of check box choices on the contact form. As mentioned, if you drill further down into the location pie chart, you’d get the counties breakdown. So if I click on Nevada, I’ll see the Nevada counties chosen. Clicking on Eureka county shows me how the city numbers shape up for that county. Remember if percentages aren’t really your thing and you’d like to see a count instead, just click the “Total Count” option for any of the pie charts shown. 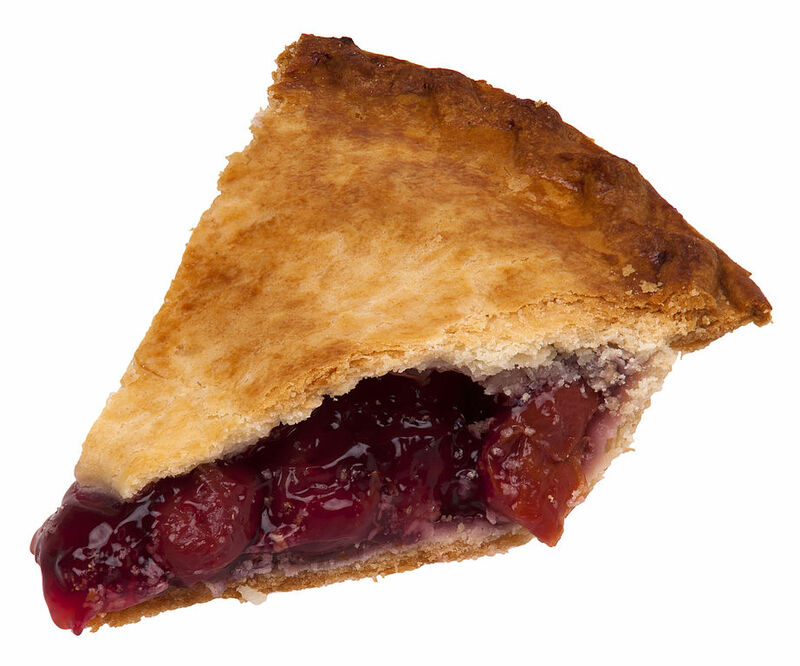 Now that I’ve told you a bit more about pie charts in iCarol, I suggest you go celebrate Pi Day in the truly best way possible — enjoy a piece of real, edible pie. In the US and some other countries we write our dates in a MM/DD/YY format so today, March 14th, is 3/14. 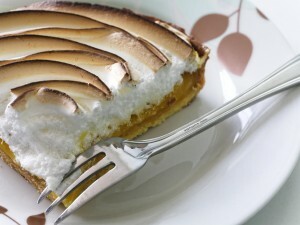 If you round Pi to it’s ten thousandth decimal place you get 3.1416 which means this year today is the ultimate Pi Day! And even though most other countries write their dates in a DD/MM format, today is generally accepted as Pi Day worldwide since we only have 12 months. If you’re nerdy like me, you can read more about Pi Day here. Yes, it’s a real thing. Yes, it has its own website. 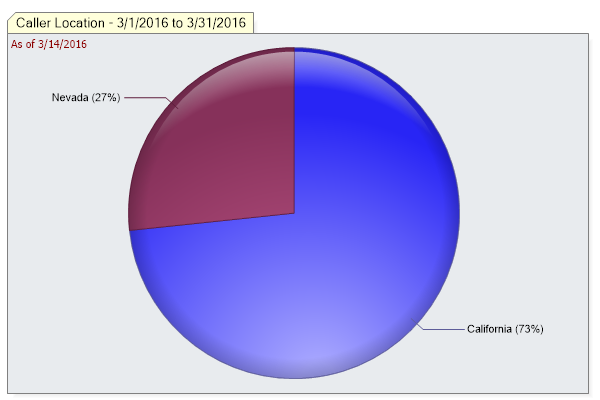 Use Pie Charts to give you a sort of broad overview of how the numbers or percentages are shaping up for a certain sub-category of your call form. Or, use it as an overview of your location breakdowns. 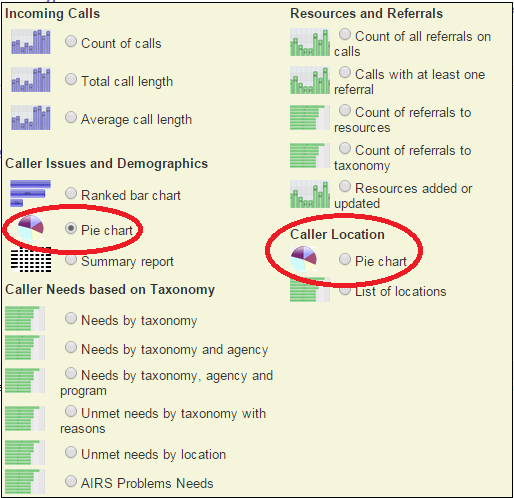 In the Analysis tab of Statistics, when selecting Chart Type, you have two Pie Charts to choose from, either Caller Issues and Demographics (which will start by showing you all the Categories on your call form) or Caller Location. The resulting charts are below. 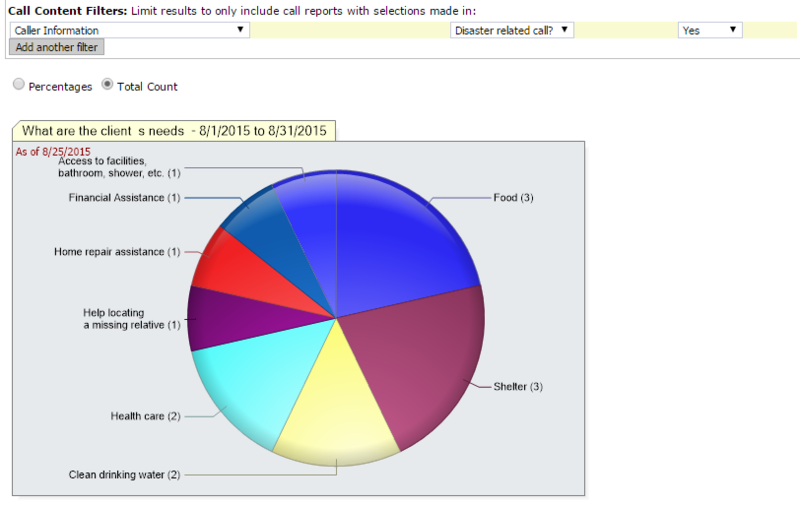 If you selected the Caller Issues and Demographics chart you get this broad overview of your call form Categories. 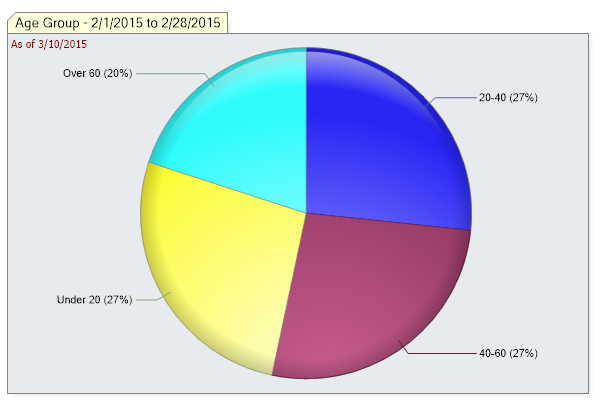 Once you’ve got that high level pie chart available, you can click on pieces of the pie to drill into the data below. Drilling into a Category will then show you the sub-categories that are available. 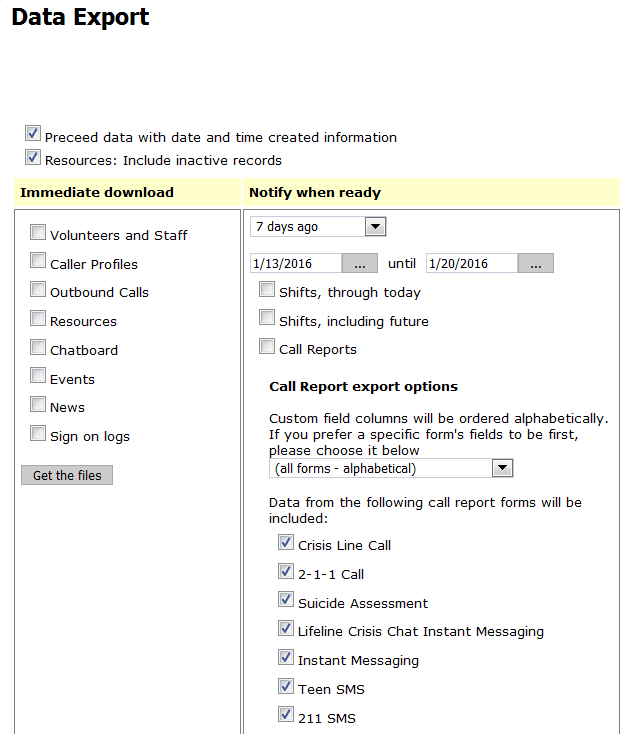 These sub-categories are the Groups or questions asked within each category on your call form. 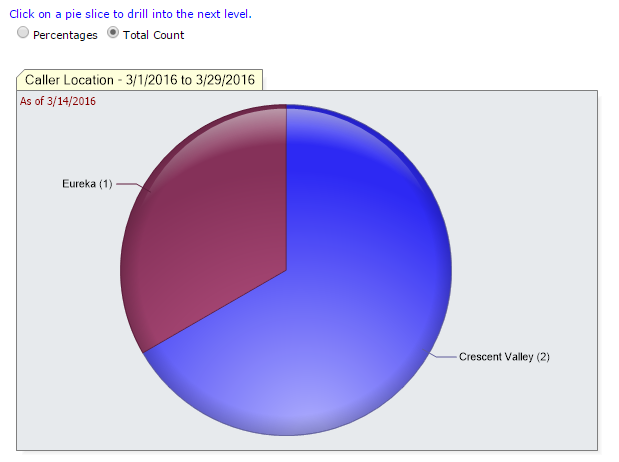 On a location chart, drilling into the State or Province piece of the pie will show you the county level information. 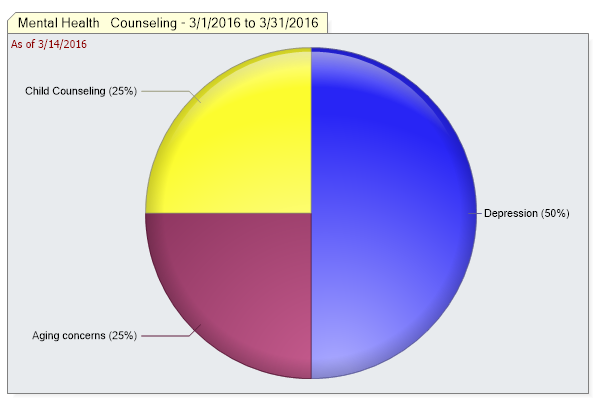 If we click on the “Mental Health/Counseling” piece of the pie, we’ll drill down to the lowest available level, which are the field choices or answer options within that sub-category. 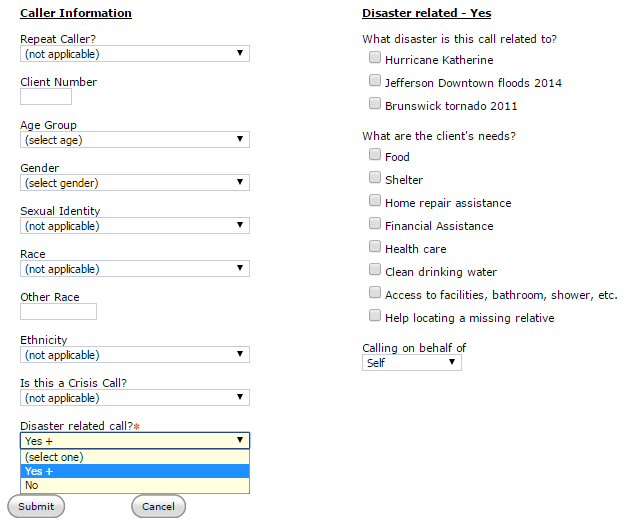 These are the items you may find in the drop-down or list of check box choices on the call form. 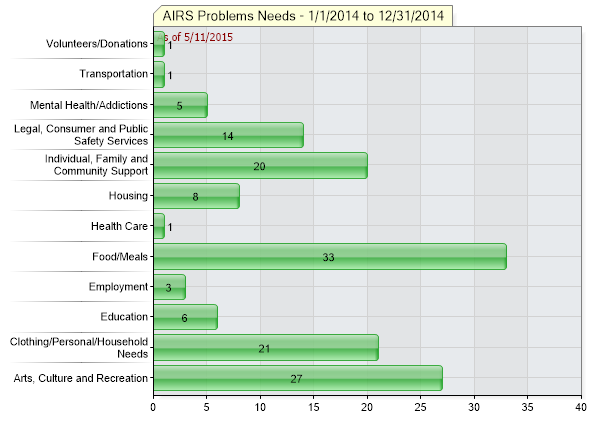 If you use the AIRS Problems / Needs categories, there will be a small change to them coming with our next update of the taxonomy. 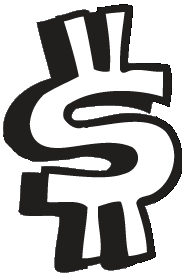 AIRS announced Medicare and Medicaid has been moved from the Income Support/Assistance category to the Health Care category. When you subscribe to the 211 Taxonomy in iCarol, you get the benefit of automatic updates and maintenance to the taxonomy about once per quarter, helping you stay current and meeting AIRS accreditation standards. 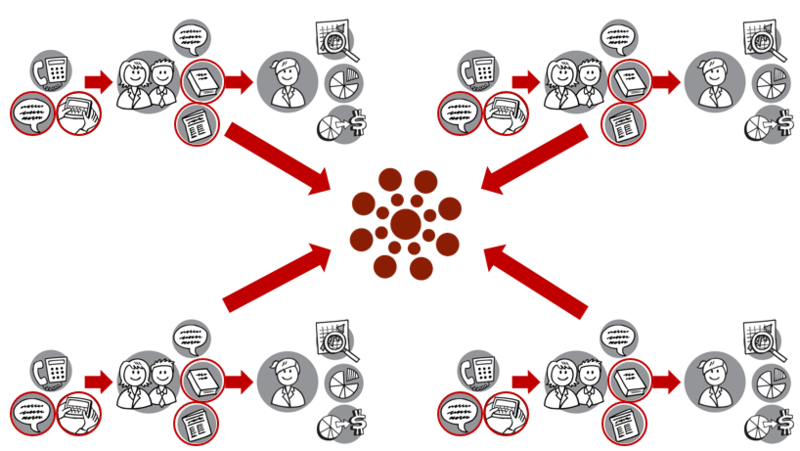 Our next taxonomy update will be in July so when that is completed, you’ll see this new Problems/Needs category change reflected in your iCarol system. 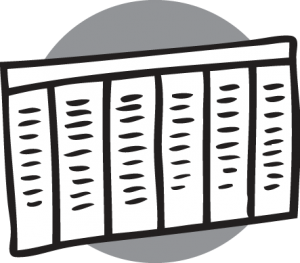 Our Taxonomy updates take care of things like adding new codes or replacing codes that have been retired by AIRS. 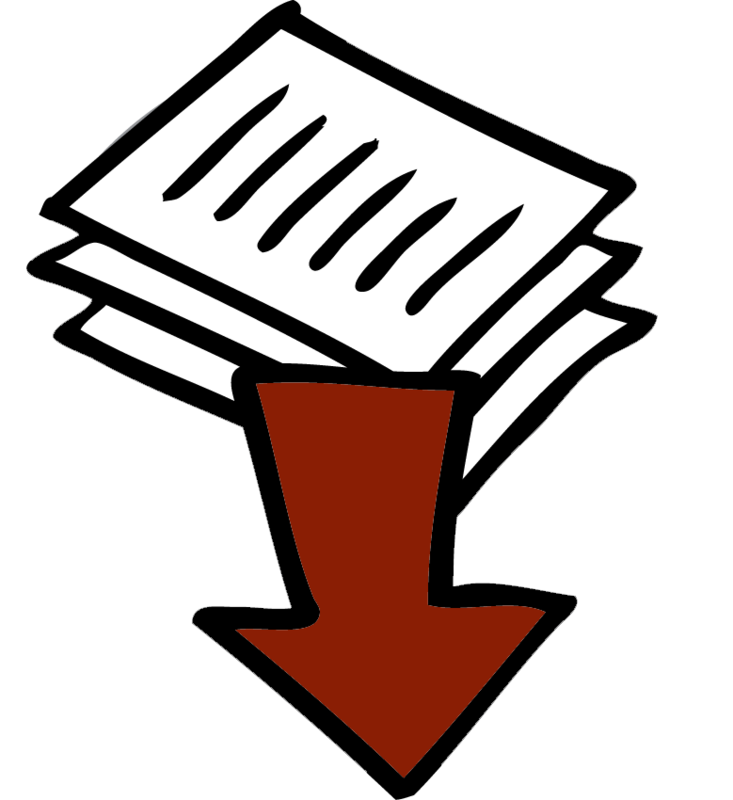 With the July update we will apply the changes to the needs categories, and we’ll automatically and retroactively place previously collected needs into the new appropriate categories, making your annual reports fall in line with what is being requested by AIRS. Happy Pi Day this coming weekend! What is Pi Day? Nominally, it’s a celebration of the mathematical concept of pi from high school geometry class (it involves circles), but my kids and I use it as an annual excuse to eat more pie. Actually, Saturday is technically Pi Day only in countries where the date format is like this: MM/DD. That’s because in those countries March 14 is written as 3/14 – get it? Pi = 3.14. People in countries that use the date format DD/MM could wait until Pi Approximation Day (yes, that is a real thing), which is July 22. That’s written as 22/7; 22 divided by 7 is 3.14, hence, pi. But who wants to wait months to have an extra serving of pie? I say go for it now. Anyway, who among the pi cognoscenti would throw stones? You can bet I’ll consider myself Australian on that date, for snack purposes. I was thinking this could also be also a good chance to extol the virtues of all the great pie charts in iCarol. 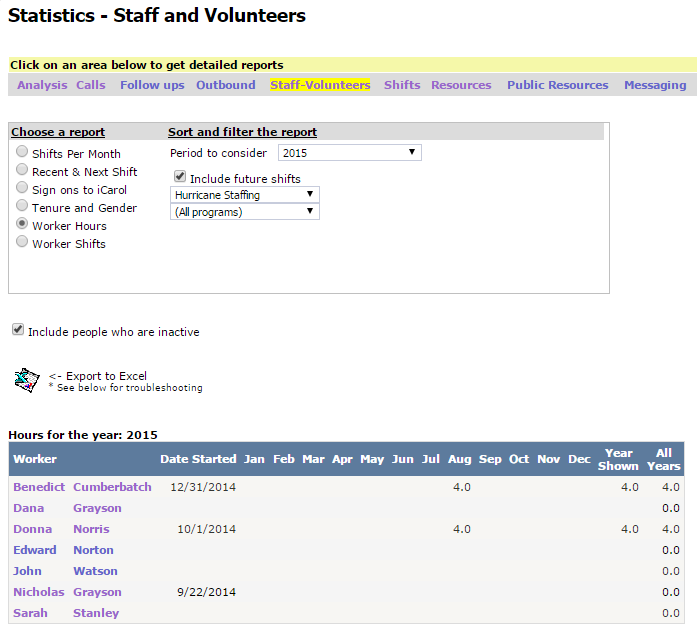 Head over to the Statistics area, and you’ll see lots of ways you could use pie charts to display your data. 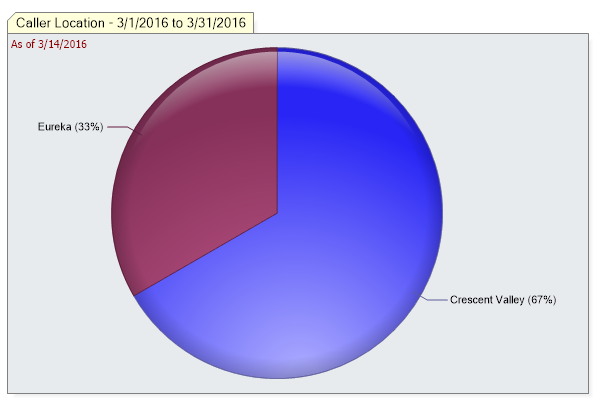 My favorite part is when you make a pie chart, you can click on the slices to drill down into the data even further. But really, that’s torturing the homonym a bit too far, with no satisfying gustatory payoff. So instead I’ll end with a handy way to remember the first few digits of pi. I can’t say that I run into too much need to calculate the area of a circle with such precision, or, frankly, with any precision at all. But it has helped me annoy — er I mean impress — friends at parties. Where, of course, I parlay this knowledge into getting extra pie. It all comes full circle (pardon the pun). “How I wish I could calculate pi easily” (that is, “how” = 3 letters, “I” = 1, “wish” = 4, etc., so the sentence helps me remember the first digits of pi: 3.1415926). I hope this earns you as many desserts as it has for me. And if you have the stomach for further party-scoring-knowledge, here’s another: Pi is considered, in mathematical terms, an irrational number. That means the digits go on forever. Somehow it gives me great comfort to know that some numbers truly, technically, are irrational.